Former U.S. Speaker of the House Newt Gingrich was in Montgomery to address the 97th meeting of the influential Alabama Farmers Federation (ALFA) Monday. Nearly one thousand farmers and business people from supporting industries were in attendance. ALFA President Jimmy Parnell said that he is a huge Fox News fan, and Gingrich always adds something to any of the Fox News shows when he is a contributor. “I consider him an expert on political ideas and issues,” Parnell said. The left has been using the court to implement social change that they could not pass through the Congress or the state legislatures, Gingrich said. “Trump has continued with deregulation,” Gingrich continued. “Then Trump did the worst thing he could have done and he went to the United Nations and said that being proud of your country is a good thing.” And the left went ballistic, Gingrich claimed. The former speaker said that having been in Washington since 1978, the bipartisanship of the past “is greatly exaggerated, but now the tension is now real and very deep. The two parties represent radically different visions of America. The left sees tax cuts as terrible because it takes money out of Washington and puts it back in Alabama. Taking money out of Washington takes power away. 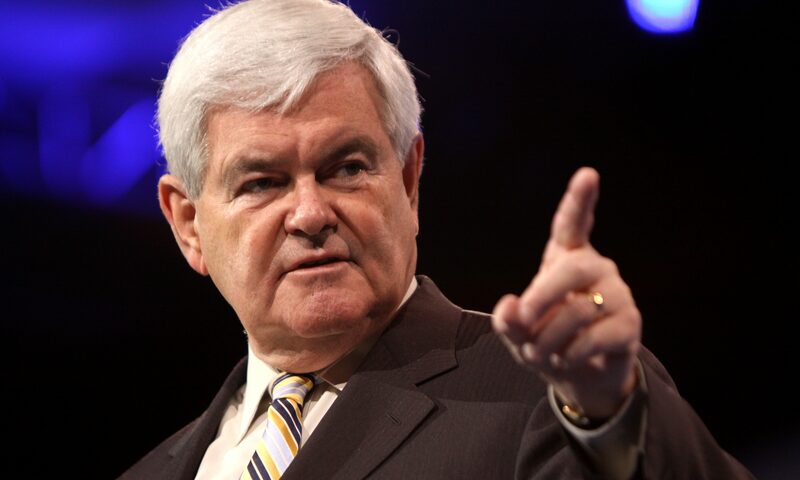 “What we have now is the largest leftwing resistance since the Vietnam War,” Gingrich said. Despite this Trump has 48 percent approval in one poll and 44 percent approval in another poll. That is higher than Reagan was at the same point in his presidency. They voted for Trump because he was kicking over the table. Sixty-three percent of the voters wanted an outsider. Gingrich said that Trump sat down with the Heritage Society and came up with a list of judges. “Almost every social conservative in the country said that if he will do that I can support him,” Gingrich said. “In that one zone alone (appointing conservative judges) Trump will be a really historic President. Gingrich said that in the election “We got two seats in the Senate and need to pick up more seats one of them could be in this state in 2020.” In the House, Obama lost more seats in 2010 and Clinton lost more seats in 1994. Both lost more seats in the first term than Trump. Both of them were re-elected. “If you really studied and understood the history of this country, then you would be a patriot and a nationalist,” Gingrich said. Chris and Jordyn Upchurch who have 400 acres north of Lineville in Clay County were also honored. They have 3 chicken houses and a beef cattle herd of 130 brood cows that has grown from his start of just seven cows when he was a boy. They also harvest hay both on their farm and on farms of other farmers and they clean out chicken houses for other farmers. The Upchurch’s are fourth and fifth generations Alabama farmers. Jordyn and Chris and their infant son, Charlie, were chosen as the 2018 outstanding farm family of Alabama. Agriculture and forestry are by far the largest industries in Alabama.